Midday on June 17, 2017, I arrived at Swift River Sportsman’s Club for the 4th Annual Flag Day Second Amendment Rally and BBQ dinner in Belchertown. At the checkpoint I received an event program and a simple, terse welcome. Beyond, the dirt road ended in a parking lot populated by an underwhelming but not insignificant number of cars. License plates revealed attendees from Connecticut, New Hampshire, and Massachusetts; and bumper stickers demonstrated support for Republican candidates, past and present, affiliations with military and gun rights groups. Stepping out of the car, I was immediately struck by the club’s pervading quietude. In the subdued atmosphere my attention was immediately drawn to the creak of a swing set, where a father pushed his son. It was almost meditative, serene. A few boy-scout-style buildings populated the grassy expanse enclosed by vivacious trees. I took my place at a picnic table under a pavilion where Springfield, Massachusetts, native Sheriff Joe Arpaio was stumbling through an apparently improvised address to approximately 200 attendees. “America’s toughest Sheriff,” as he is commonly called, is some sort of pop star sheriff hailing from Maricopa County, AZ, where he served six consecutive terms from 1993–2016 and erected the famous “Sheriff Joe’s tent city,” which housed the incarcerated in sweltering heat. He paraded via chain gang his inmates in pink shorts and flip-flops and was infamous for staging elaborate publicity stunts, including one where he pursued low-level drug offenders in a military tank with his name on it. But his reputation may be most remembered for his terror of immigrants, as he cavalierly supported section 287(g) of the Immigration and Nationality Act, which deputizes local law enforcement to act as federal immigration and customs enforcement agents. Here in Belchertown, his fiery résumé juxtaposed with his sleepy oration. The address consisted of a mixture of self-defense and finger-pointing. Arpaio’s speech wandered; the lamentations and exertions struck the expected chords with the crowd. Rebuffs of liberals obstructing his ability to do his job and of weak law enforcement by others plotted an unremarkable course. Lacking was a real sense of vitriol, vigor, or any clear agenda beyond resistance and blame. Everyone seemed to be going through the motions, repeating tired doctrines, confirming ideologies. In this was a deep sadness, depression. The event was almost funerary; mourning the loss of halcyon days of simplicity, clarity, control, comfort, and familiarity—days that certainly never existed in reality. Occasionally distant gunshots broke the moribund atmosphere, but these shots too felt lethargic. Like distant thunder on a thick, summer evening they promised cathartic release, but instead remained resigned in the background to sulk, to oppress. I shook myself: Wasn’t Trump president? Weren’t all the fears of liberal control assuaged (at least momentarily)? Wasn’t this the incendiary right? These defenders of our nation struck me as playing victim, appealing to each other for defense, encouragement, displaying a vulnerability I never expected. 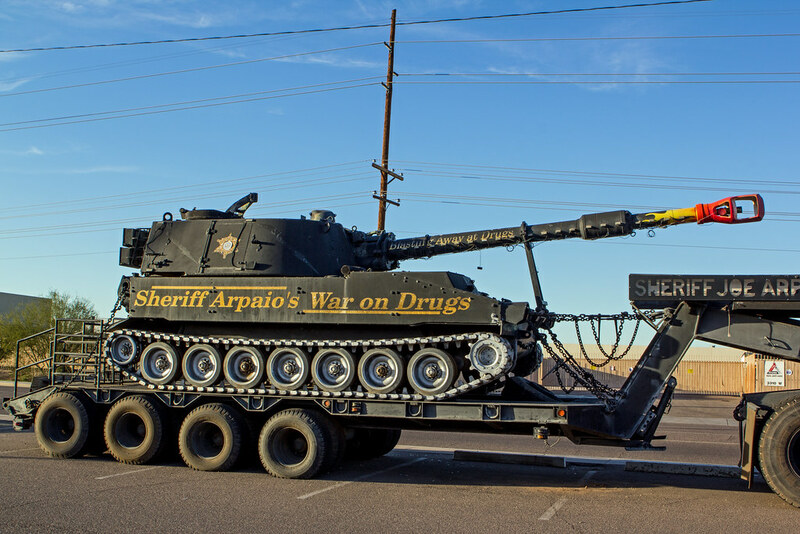 Finally Arpaio’s right-wing banalities slowed and he turned to the event organizer to ask, “How long do I have?” Full of respect and adoration, the rally’s organizer and host Dave Kopacz said that, being Sheriff Joe and all, he could speak for as long he desired. His response was “I went to an Italian restaurant last night. Does anyone know anything for diarrhea?” Laughs, a few more comments, “I don’t have any hobbies, so I’ll be around”—more of a notification than a threat—and the address concluded. Applause gave way to a series of rapid questions exclusively focused on the Obama birther movement. Conspiratorial and technical questions—about released Photoshop documents of Obama’s birth certificate and accusations of CIA-agent parents—were answered with inconclusive pandering of “my guys are on it” and “believe me, it’s real.” The energy in the room reached a nadir of momentary simmering, then dissipated. I shook myself: Wasn’t Trump president? Weren’t all the fears of liberal control assuaged (at least momentarily)? Wasn’t this the incendiary right? These defenders of our nation struck me as playing victim, appealing to each other for defense, encouragement, displaying a vulnerability I never expected. Next, Jeanette Finicum, widow of rancher LaVoy Finicum, who was killed by the FBI in a standoff over illegal private grazing of public lands, addressed the crowd as part of her national speaking tour. Noticeably fewer people stayed in the tent, and outside conversation, cigarettes, and drink picked up. Jeanette told the long story of her late husband, their good Christian ways, and the struggle to make ends meet honestly. Her confirmation of strong family values—“I was just a domestic engineer, a stable mom”—garnered head nods and applause. A sweet but constrained sense of humor—“I covet your grass and I will repent later”—elicited chuckles, albeit with less enthusiasm than for Sheriff Joe. She too meandered, playing victim and appealing for support, confirmation that her quest was the right one. Just what that quest was, though, was uncertain. She drummed incredulity—how could she, a proud defender of this country, be betrayed by her own government? And how could her country take away her livelihood as a rancher? Clearly America was lost—a society without morals, lacking law or order—and it was her mission to share her story and guide people in its reconstitution. Glaringly absent in such questions was a more nuanced perspective of governance, the public, and welfare, or a deeper, structural critique of corporate capitalism and its inherent disempowerment of citizenry. Ironically, the Finicums’ primary source of income (the ranch generated none, even while ignoring government grazing regulations) came from the federal government for operating a foster home, a certain form of welfare assistance. The totality of the event—Sheriff Joe Arpaio’s address, the resulting questions, Jeanette Finicum’s plea, Dave Kopacz’s interludes, and the subsequent speakers—came across as a disarray of ideology, logic, and rationality. Contradictions and blame abounded, but political strategies and coherent policies remained scarce. The familiar was revered—“Ah, I love this. We got the constitution and the cross”—and anything that didn’t fit their paradigm decried: gun restrictions, immigrants, Islam, gender studies, zoning laws. What transcended this jumbled rhetoric was a narrative of vulnerability, loss, and insecurity. Speakers cultivated a feeling of dispossession, as if someone had taken something, and all were impassioned to right the wrong. But this “something” and “someone” were hard to pinpoint. Instead a worn rendition of the “us” versus “them” plot was enacted on stage, begging for a new script and set design. Next Post Will Surveillance Cameras Stop Wage Theft?